Coming off the heels of his remix producer album <i>Phazed Out</i> (mixed by DJ Rhettmatic), ARIA Award winning producer M-Phazes offers the 'Untagged/No DJ' album version bonus track "Holdin' It Down", featuring industry upcomer Emilio Rojas and burgeoning R&B/Soul singer-songwriter Rich Rivera, available for individual download. The single, which was previously only made available as an 'album only' download, showcases M-Phazes signature use of soulful melodies and loose smacking drums, coupled with Emilio's sincere rhymes about staying true to his identity through the trials and tribulations of his success as an artist. Buy M-Phazes (feat. Emilio Rojas & Rich Rivera) - "Holdin' It Down"
Users who like M-Phazes (feat. Emilio Rojas & Rich Rivera) - "Holdin' It Down"
Users who reposted M-Phazes (feat. 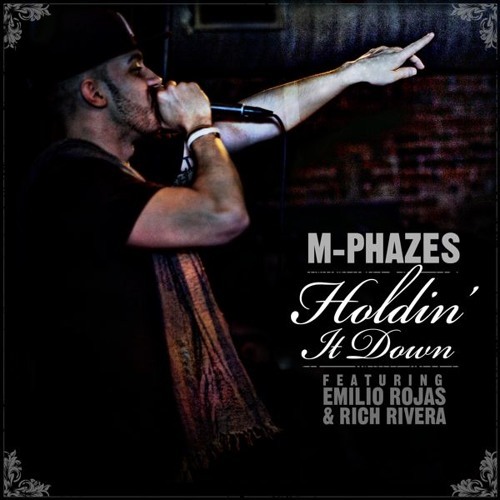 Emilio Rojas & Rich Rivera) - "Holdin' It Down"
Playlists containing M-Phazes (feat. Emilio Rojas & Rich Rivera) - "Holdin' It Down"
More tracks like M-Phazes (feat. Emilio Rojas & Rich Rivera) - "Holdin' It Down"